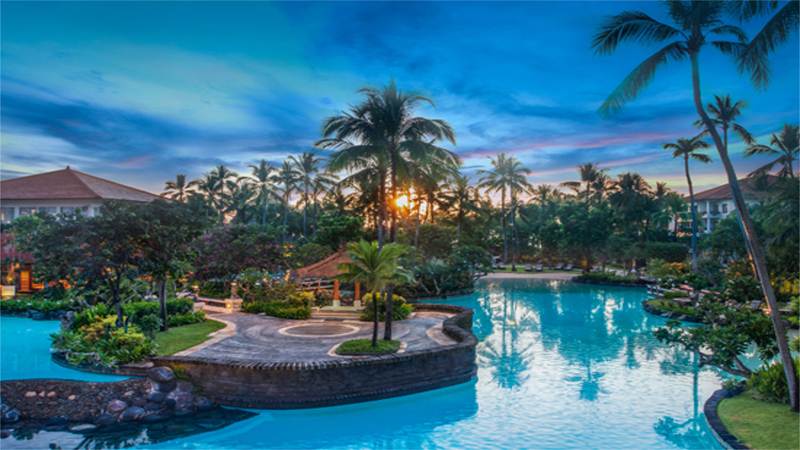 Sitting amongst giant palms beside the gorgeous Pantai Samuh beach, the divine 5-star Laguna Resort and Spa, Nusa Dua, delivers a true taste of luxurious tropical life. Created around several beautifully-landscaped lagoon swimming pools and lush gardens, the Laguna Resort offers exceptional elegance and unrivalled sophistication. Guests can unwind in the lap of luxury, taking advantage of the exceptional Balinese hospitality, while the stylish rooms, suites and villas offer the perfect sanctuary to unwind in complete solace. Those staying in the unique lagoon access rooms have the advantage of being able to step from their private terrace, straight into the crystal clear waters of one of the stunning lagoons, while those enjoying the luxury of the Villas, have their very own pool and private garden. The resort also boasts two delightful restaurants, offering a variety of cuisines, as well as a deli and a bar serving light meals and refreshing cocktails in an enchanting beachfront setting. With all this and more, guests are sure to enjoy every moment of their holiday at the magnificent Laguna Resort and Spa. The Laguna Resort and Spa has direct access to Pantai Samuh beach. The Laguna Resort is close to shops, cafes and restaurants, and just a short stroll away from a nearby shopping mall. 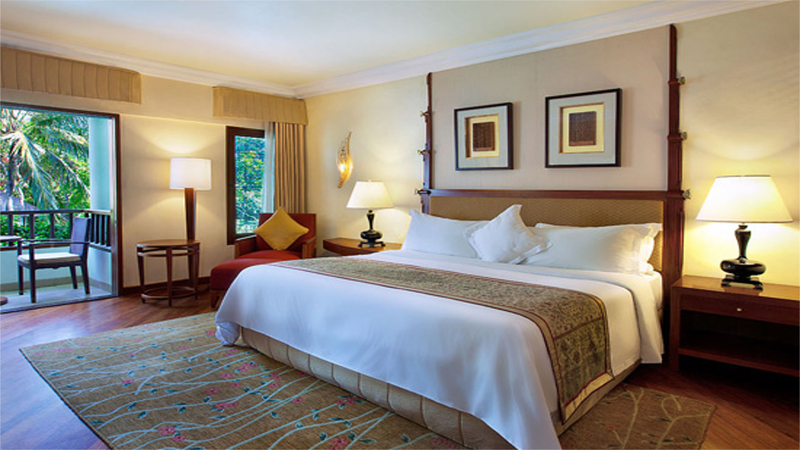 Ngurah Rai International Airport is approximately 13km away from the Laguna Resort and Spa. The fully-equipped Studio Rooms at the Laguna resorts are perfect for anyone looking for a comfortable and spacious sanctuary to unwind during their Bali break. 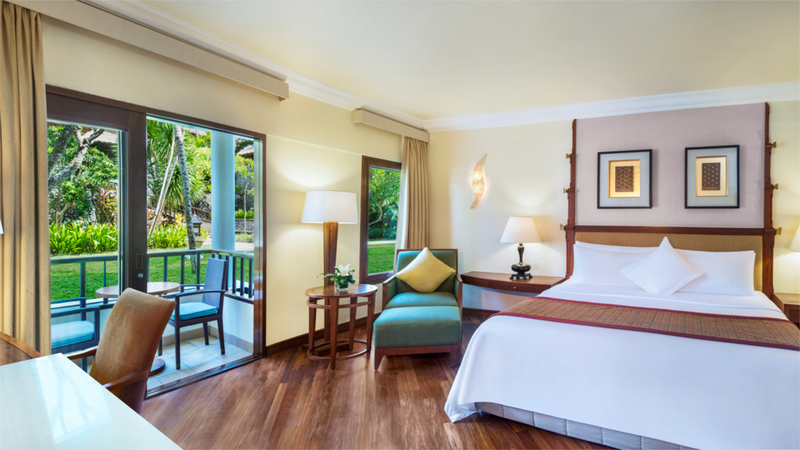 While the Deluxe Studios offer panoramic views of the garden, or lagoon, the Deluxe Studio Lagoon Access rooms provide guests with direct access to the resort’s lagoon. 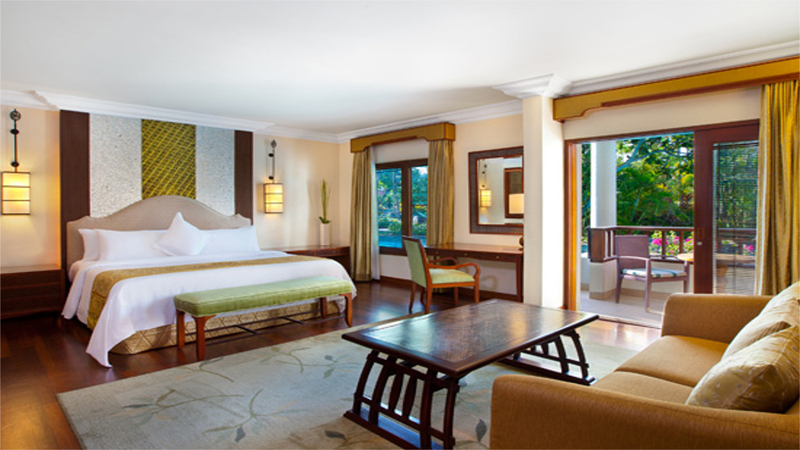 The Laguna Resort’s spacious and modern Deluxe Rooms offer guests a delightful space to unwind during their Bali getaway. Those staying in the Deluxe Lagoon Access can enjoy the advantage of having direct access to the lagoon. 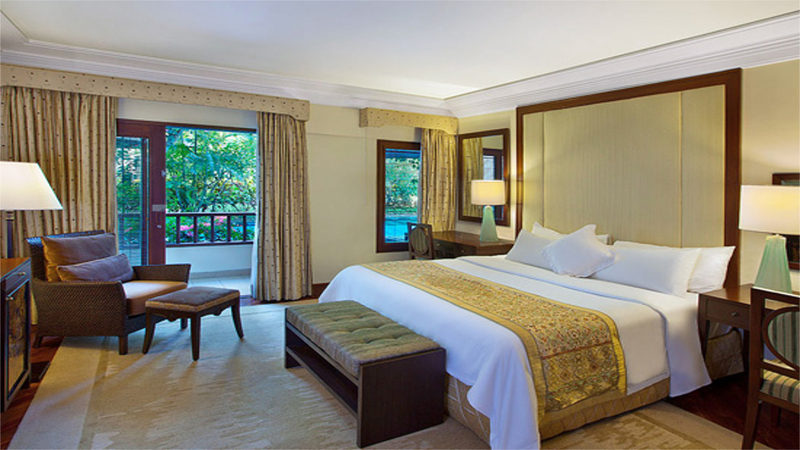 The Laguna Resort’s elegant suites provide comfortable homes from home for guests, with a separate bedroom, dining area and living area. The Executive Suite and Deluxe Executive Suites offer panoramic garden or lagoon views, while these staying in the Lagoon Access Suite have direct access to the lagoon. 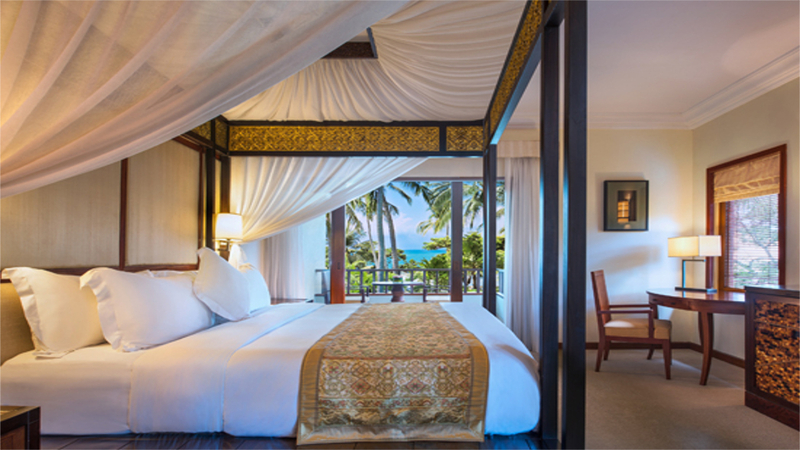 With a spacious bedroom and separate bedroom, dining area and living space, the luxurious Premium Suites offer guests a delightful sanctuary out of the Balinese sun. Those staying in the Grande Lagoon Suite have the advantage of direct access to the resort’s lagoon. Located in the Laguna resorts Secret Garden, the exquisite villas offer guests an extravagant tropical sanctuary where they can unwind in the lap of luxury. Combining outdoor island living with refined Balinese décor, the exclusive Hibiscus Villas and one and two-bedroom Laguna Pool Villas offer an enchanting haven, where guests can enjoy a once in a lifetime getaway in the heart of paradise. Located in an enchanting beachfront location, with stunning view out over the Indian Ocean, the Arwana Restaurant offers a tempting selection of seafood cuisine. Open for lunch, afternoon tea and dinner, guests can choose from an extensive a la carte menu and enjoy the theatre of the chefs creating culinary delights in the open-air kitchen, or at the sushi and oyster bar. Overlooking the turquoise waters of the resort’s lagoon and lush gardens, the Banyubiru treats guests to a delicious menu of international and Pan-Asian cuisine. Offering breakfast and dinner in a sophisticated and relaxing atmosphere, dinners are kept entertained by the busy chefs showcasing their skills in the state-of-the-art open kitchens. As well as serving Asian fusion, international and themed buffets, Banyubiru also offers an extensive à la carte menu, as well as a Balinese blessing ceremony dinner every Wednesday and Sunday. A selection of snacks, homemade ice creams and pastries are available for guests to enjoy in the comfort of the Cornerstone Deli, or takeaway to eat elsewhere. With outdoor seating and a pool table, the Cornerstone offers a laid-back venue to enjoy breakfast, lunch or dinner. Open from 8am to 10pm. Situated in a casual and relaxing setting by the beach, the Kulkul Bar is the perfect place for guests to enjoy a light meal or a thirst-quenching cocktail, while enjoying the live entertainment on offer in the evening. Open from 9am to 12midnight, with live music from 6pm to 7pm.